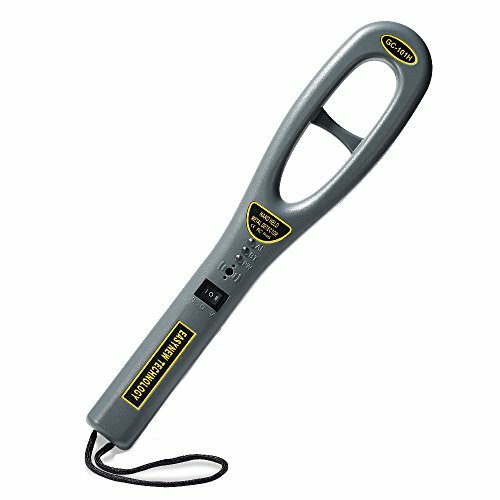 The portable hand held metal detector has fast detecting speed and high sensitivity. Perfect for safety check and the detection of prohibited goods, electronic products, metal etc in station, frontier defense, school, court, venue, factory and so on. Please tear the paster and you will see the sensitivity Adjuster hole. (Turn the detector). Use a small straight-shaped screwdriver (NOT INCLUDED) to retate the counter-clockwise until a sound is heard. Then rotate clockwise, until no sound is produced. Then you can rotate for another half a circle, until the sensitivity meets your requirement. 1. Remember to turn off the power after using it; Take out the battery if you don't use it for a long time. 2. Please pay attention to use rechargeable battery when you charging the detector, and avoid charging it when you have no rechargeable battery, otherwise may cause the explosion of battery; Please turn off the power switch when you charging the detector. 3. The charger voltage are AC 9V, DC 10V. Please use the full power source, or may cause the detector can't work normally. HIGH SENSITIVITY and FAST DETECTING: Detecting temperature range is -15 ~ 45℃, large detecting probe area, even Detects Small Hidden Metal Objects. ADJUSTABLE SENSITIVITY: The sensitivity can be adjusted for your need. TWO ALTERNATIVE ALERT WAYS: you can choose between audible tone or vibration . Powered by one 9V battery (included). With a external charging port, you also can charge it with a rechargeable battery (not included). THREE-COLOR INDICATOR: green for power, yellow for under-voltage, red for alert. If you have any questions about this product by dostyle, contact us by completing and submitting the form below. If you are looking for a specif part number, please include it with your message.